Fallout 4 is a massive game. Like most of Bethesda’s open world RPGs the game is vast and filled with a seemingly endless number of things to do. You can quite literally put hundreds of hours into Fallout 4. In addition to being critically lauded, the game has been a huge success commercially. The problem? The game bores the hell out of me. After putting nearly 40 hours of playtime into Fallout 4 I have grown tired of loading screens, clunky UI, and the need to constantly manage my inventory due to over-encumbrance. I feel as though I spend more time in menus and looking at my phone than I do playing the actual game. I had a Fallout 4 fever, and the only prescription? More gameplay. Enter Rocket League. I was a bit late to the party when it came to Rocket League. While I had consistently heard positive reviews and even watched a few matches online I still didn’t pull the trigger on the game. The game looked fun but I wasn’t sure it would hook me. Finally after the 2015 Video Game Awards in which Rocket League took home the awards for Best Sports Game and Best Indie Game I decided to jump on the bandwagon. What can never be properly conveyed by simply watching a match of Rocket League is the massive amount of satisfaction and excitement the game generates. I have found myself literally jumping out of my seat after scoring a clutch last minute goal. Rocket League has produced some of the most excitable moments in gaming for me. The designers nailed the sense of tension and the build up that you see in a real match of soccer. When a goal is scored in Rocket League, the ball explodes in a cloud of dust launching player cars every which way, this perfectly captures the emotional outburst you feel when scoring in a tight match. Rocket League nails the single sentence pitch; it’s soccer with cars, but really it is so much more than that. Rocket League is pure gameplay. The game is brilliant in its simplicity. The menus do exactly what they need to, no more, no less and the loading screens last less than 5 seconds. Everything about Rocket Leagues seems to be about putting you into a match as quickly and efficiently as possible. A standard match in Rocket League is five minutes, making it the best drop in and out game I’ve ever played. Play Fallout 4 for 5 minutes and you’ve barely made it halfway to your quest marker, play Rocket League for 5 minutes and you’ve experienced a satisfying dose of gameplay. 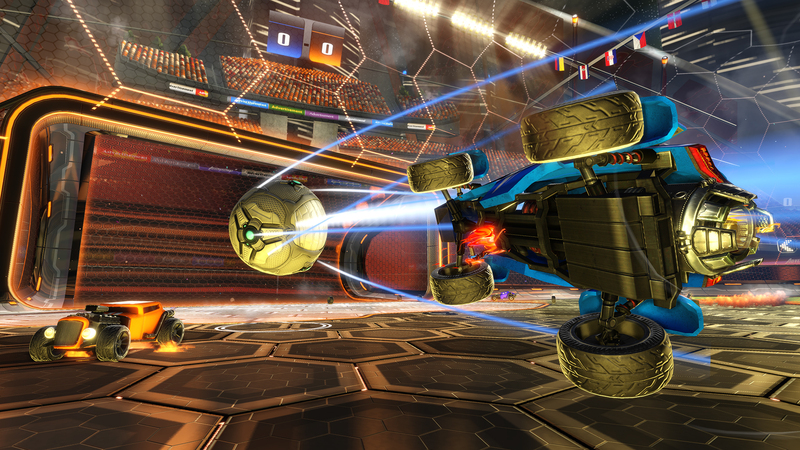 Perhaps the best thing about Rocket League is just how stripped down it is. While Fallout 4 wants you to eat, cook, build a settlement, and do a million other things Rocket League just wants you to play soccer with cars. Sure there a tons of aesthetic modifications you can make to your car, but that’s just it, they’re purely aesthetic. Every car body, set of tires, and rocket boost trail may look different but they all function exactly the same. There are no stats to compare, no prize unlock that will make the game easier, every customization combination plays the exact same. This isn’t to say that Rocket League is a shallow game. In fact, what makes it so satisfying is the feeling of progression you feel playing it. While your first few games will undoubtedly be a bit rough you can tangibly feel yourself get better as matches progress. Start the 20 game season mode and you will be an infinitely better player by the end of it. I’ve played over 100 games and I can still feel myself getting better with each match. 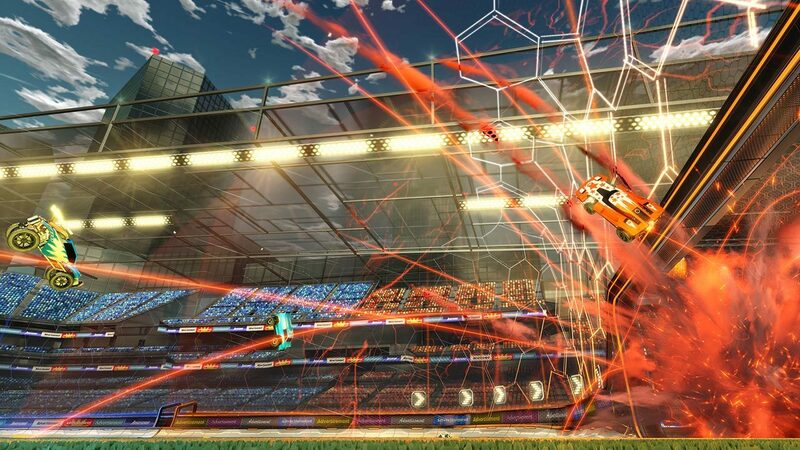 In an era where games regularly last over 50 hours Rocket League is a breath of fresh air. Not only do I prefer it to Fallout 4, I prefer it to most games. I would even go so far as to say that it is currently PS4’s best exclusive game. Next Next post: How Do Games Create Immersion?